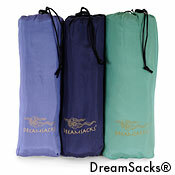 The DreamSacks® Silk Airline Comfort Set has been discontinued. The DreamSacks Silk Airline Comfort Set has been discontinued. Reduce your chances of getting sick while traveling! Research suggests the chance of catching a cold is up to four times higher during travel. For those of you who want to arrive at your destination cold free, we recommend the DreamSacks Silk Airline Comfort Set. Perfect for airplanes, trains, buses and long car rides, this set includes a travel silk pillowcase, soft silk eye shades and a silk noil blanket, which conveniently fit into a 12' carrying bag. 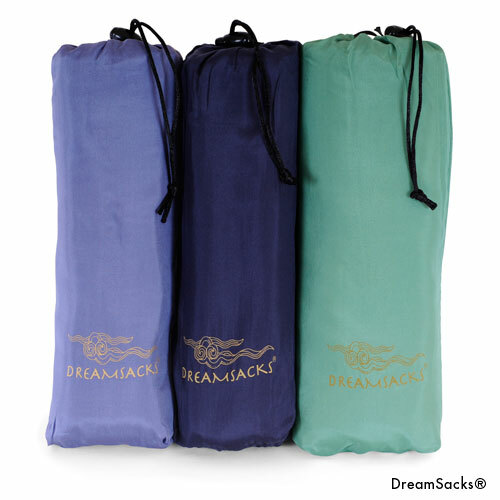 More importantly, by having the DreamSacks Silk Airline Comfort Set you are avoiding the added exposure to germs found on recycled blankets and pillows offered by airlines and other means of transportation! Available in Lilac, Midnight Blue or Surf. Is sensitive to synthetic fabrics. Wants their own hygienic travel blanket, pillowcase and sleep mask. Made of Noil silk. Noil silk is sometimes referred to as raw silk. The beautiful flannel texture of Noil silk keeps the blanket from sliding. Silk travel size pillowcase measures 15" x 20"
Hand or machine wash gently, cool water, mild soap. Air dry. 30 day return policy for unopened or defective items. Items shipped to Canada cannot be returned unless defective as covered by to the manufacturer’s warranty.